Julia Hughes, author "The Griffin Cryer" has written another thrilling adventure, this time set on Ella-Earth, which is our world's twin in most respects. Except –both evolution and science have taken a different path, and an elite troop known as "The Griffin Riders" patrol the spiritual conduits known as ley-lines. 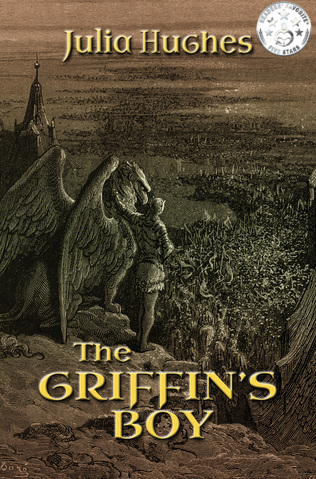 THE GRIFFIN'S BOY WILL BE FREE TO DOWNLOAD - FOR FIVE DAYS FROM MARCH 1ST - MARCH 5TH INCLUSIVE. Neb, whose name translates as 'Nobody', has ambitions to become the equivalent of our world's stable-lad – a griffin-boy. However, on recruitment day, his favourite griffin, Balkind, disgraces them both. But Neb won't take no for an answer. He steals Balkind, and flies off in pursuit of The Griffin Master, determined to change the cantankerous old warrior's mind. What follows is a breath taking flight of imagination, as Neb risks first his life, then his soul and finally his heart in his quest to become a griffin boy. As a Londoner, I'm enchanted by the legend that griffins are the guardians of this ancient city. In my mind, they combine the characteristics of two of our most beloved animal companions: Horses and dogs – with of course the added bonus that they have wings! As anyone who's read "The Griffin Cryer" knows, I believe that if you only believe in yourself, against all odds, help arrives from (very!) unexpected sources. If you have self belief, then you have the will to succeed – and you will succeed! So dream big and fly high – the only limits are the ones we place on our imaginations. Both offers end on the 6th March, around 9.am GMT London. Until then, celebrate the season of Spring and new hope! The Griffin's Boy - free from lst March. Offer ends midnight EST time 5th March. (around 9.am GMT London). The Griffin Cryer - special offer price of only 77p, or 99 cents. Offer starts March lst & ends 5th March.